New Research Looks At Primate Births : 13.7: Cosmos And Culture Anthropologist Barbara J. King talks with scientists who looked at the differences in the birthing processes of experienced and first-time monkey mothers — and how they compare with human births. During a 10-year span, a team of primatologists witnessed 15 daytime births in wild gelada monkeys residing in the grasslands of high-altitude Ethiopia. It's unusual to witness daytime births. Most monkeys and apes give birth at night, probably because it's adaptive for new mothers to have time to rest and recover from labor before having to keep up during group travel and, possibly, confront predators. It's still unclear why these 13 live births and two stillbirths — a small percentage of the overall births that occurred during the decade of observations — took place during the day. It may be because this well-studied band of about 200 monkeys provides extra protection for new mothers through its sheer numbers, thus, to some degree, relaxing selection pressure against daytime births. Behavioral biologist Nga Nguyen and her colleagues in the Guassa Gelada Research Project describe the births in a new paper in the American Journal of Physical Anthropology. The paper provides "the most detailed account of behaviors surrounding birth for any wild nonhuman primate to date." Two issues taken up in the paper are particularly fascinating: How do the behaviors of experienced mothers (nine of the 15 geladas) differ from those of first-time mothers? And how does the geladas' birth process compare with that of humans? "At Guassa, gelada mothers with prior experience delivering at least one other infant were more likely to: a) give birth later in the afternoon; b) give birth away from conspecifics; c) manually assist infants out of the birth canal; and d) consume the placenta following delivery of the infant." These learned behaviors seem likely to confer advantages, as the researchers explain. Giving birth later in the day allows more recovery time; staying away from the group might cut down on aggression from other females during labor; guiding the fetus out of the birth canal reduces the risk that the infants might fall to the ground; and eating the placenta may result in ingestion of a dose of pain-mediating opioids. In humans, placentophagy almost never occurs — though exceptions do exist — and this is just one way in which we humans aren't typical when it comes to primate birth. Women in labor usually have active help from birth assistants and, in fact, human birth is a social event or ritual visibly important to our whole family — maybe even our whole community. This isn't so for the monkeys. This divergence attests to the intensification of our social and community bonds throughout the period of human evolution. Other differences are related to the evolution of bipedalism in the human lineage. 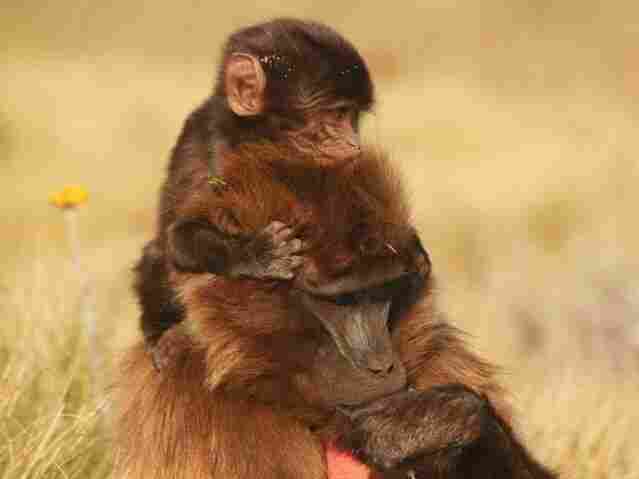 Most of the gelada infants in this study (11 of 15) were born face-first, with head and neck extended. Human babies are typically born with the top of the head appearing first and directed toward the mother's spine, or as it's sometimes called "facing backwards" (as chimpanzees' babies may be as well), with the neck flexed. Our species-typical birth presentation happens after what Nguyen et al. describe as "a complex series of rotations" as the fetus travels through the birth canal. That precise sequence happens because women, owing to our bipedal gait, must birth large-brained babies through a pelvis that is narrow, with bony projections that protrude into the birth canal. Back in the 1980s, I studied how infant baboons in Kenya learn from their elders what foods to eat. Among my most memorable moments during those 14 months was rejoining my study group in the early morning to discover an hours-old, black-furred, pink-eared baby clinging to a monkey mom's chest. I never was lucky enough to witness an actual birth, though, and so I was curious to know what that experience felt like. "I was following the geladas across the Afro-alpine grassland and was climbing out of a valley when I noticed [female monkey] Belle was adopting a strange stance and whipping her tail around in a peculiar way that I had never seen before. The realization that Belle was about to give birth struck me with a weight of responsibility and importance, and I responded by documenting every detail of the process I could, to the point of being painfully focused and even detached from myself during the event. Meanwhile, Belle's family members continued to graze and grunt as though nothing spectacular was occurring, suggesting that this event is one, of only a few, that a female gelada bears alone." "While the geladas are habituated to human presence and data are being collected on subjects surrounded (most of times) with their group members, the birth events were characterized by a sense of vulnerability because while the other group members often kept moving further, the behavioral options of the individual in labor appeared to be limited by [her] condition. I recall feeling affected by the seeming calmness of the individuals giving birth, albeit the actual level of their inner discomfort or stress remained unknown to me." "Like nearly every female mammal the world over, human females alone carry infants internally, give birth to them, and provide much (if not most) of their care after they are born. And like our primate cousins, human females give birth to big-headed kids, and must somehow maintain ties with their friends and families even after giving birth, while being largely (or wholly) responsible for the well-being of their newborns. These are some of the challenges that human females share with their primate brethren, and research like ours highlights the ties that bind us to each other." So, yes, specific differences are documented in how monkeys give birth versus women. But meaningful similarities exist, too, for female primates in these major life events. The ties that bind us in evolutionary perspective? I couldn't have said it better.